Old VW find. 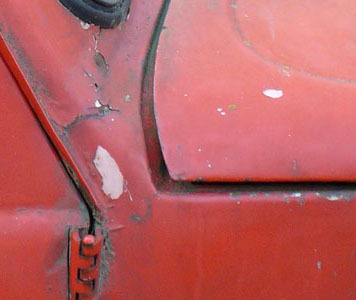 Could this be a VW38? Late last year I came across information on this old VW. 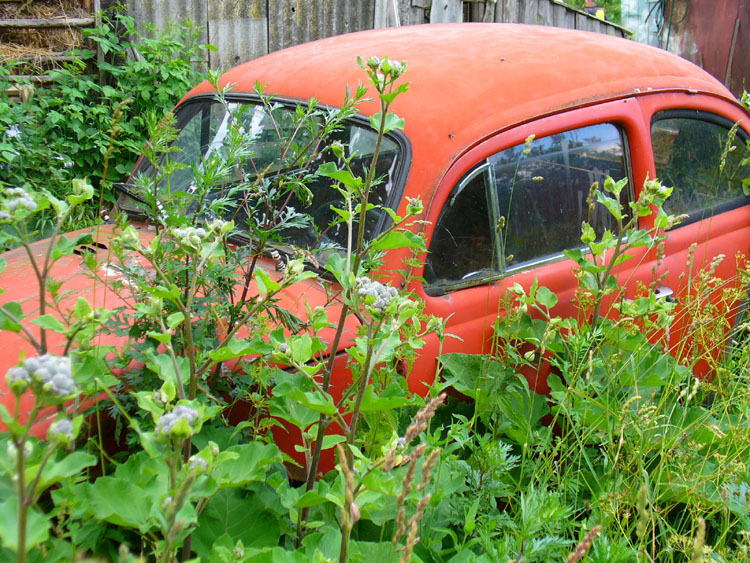 The car was found in Lithuania last summer and rescued. I contacted the gentleman who owns it now to get more information on this interesting vehicle. It’s history is very unclear. Most likely at the end of the war it was brough back from Germany by a returning soviet army person. Quite a lot of cars were taken from Germany this way, so it is quite possible. Difficult to say what was done to it during its life, but the last modifications may have taken place as late as the eighties. In its final form only parts of the original body are still intact. The whole of the chassis has been changed to one from a front engined soviet Volga. 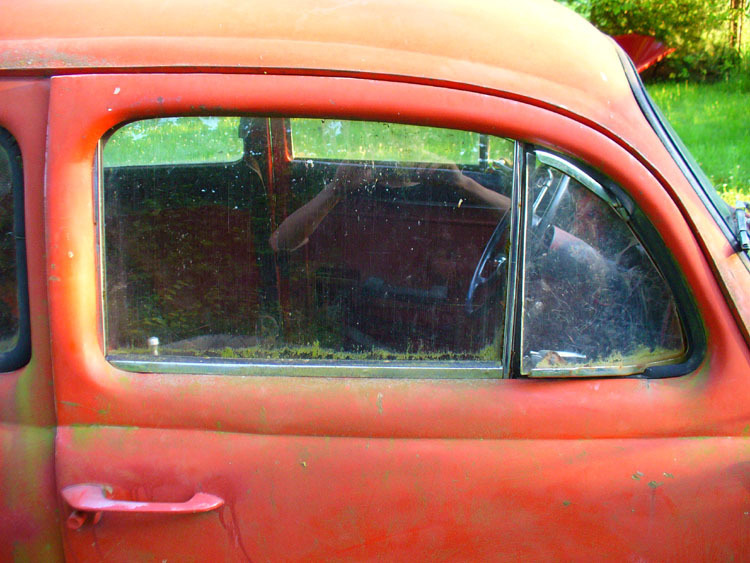 The windscreen has been swapped, the rear window replaced with a one piece… the list of attrocities goes on. It really is heartbreaking to see such a historically unique car this way. The dating of this VW is actually not that difficult. That said, I invite all VW gurus out there to correct/add to my thinking here. 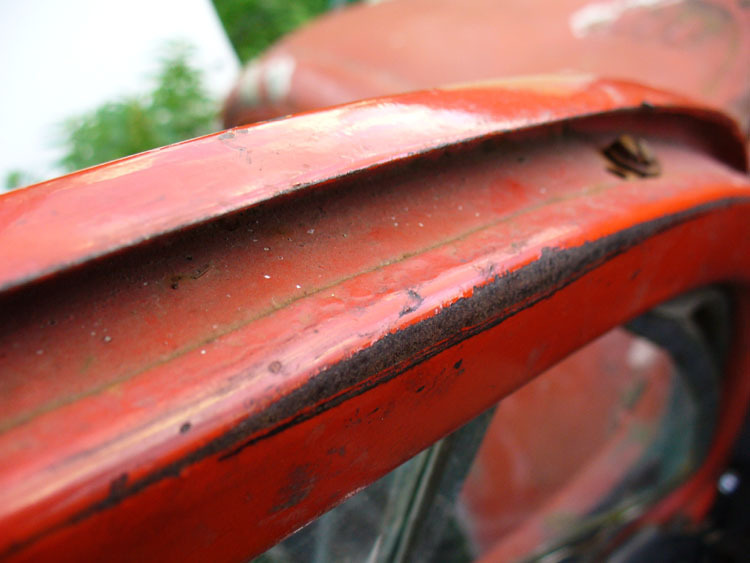 One of the first clues is the sharp corners of the decklid and of the front hood. I cannot imagine anyone going through the trouble of changing those areas. Unlike all the butchery that this car has suffered, I’m pretty sure those corners are original to the car. Considering that the three V303 cars, present at the factory cornerstone laying ceremony, were later destroyed, this can only be one of the next batch of pre-pocuction beetles built between May – October (?) 1938. That would make it, the so called VW38 series. Besides being cut down at the bottom, the decklid seems to have survived well. Again, notice the rised hump for the license plate light, a distinct feature of the pre-war beetles. The inside of the decklid is just as interesting. The bracing where the hinges attach is smooth with no holes. 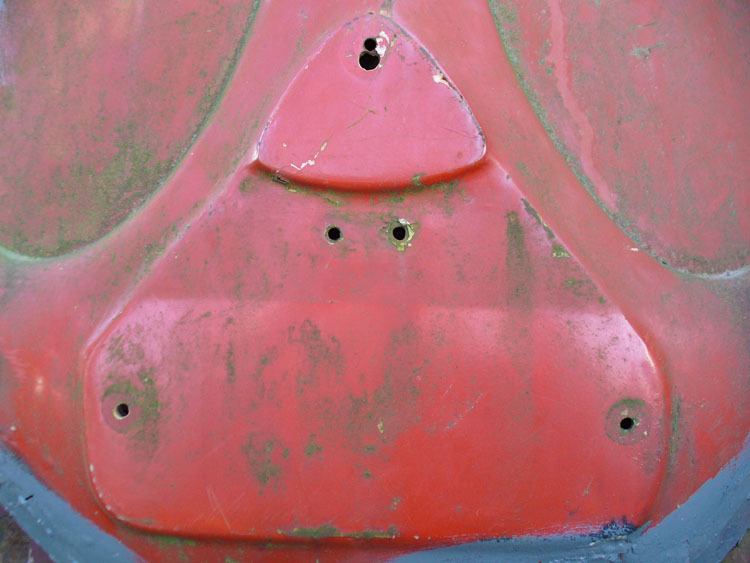 Theses holes appeared only later with the VW39 series and were carried into the KdF era. What about the long braces running from the hinges to a crossbar at the bottom of the lid. 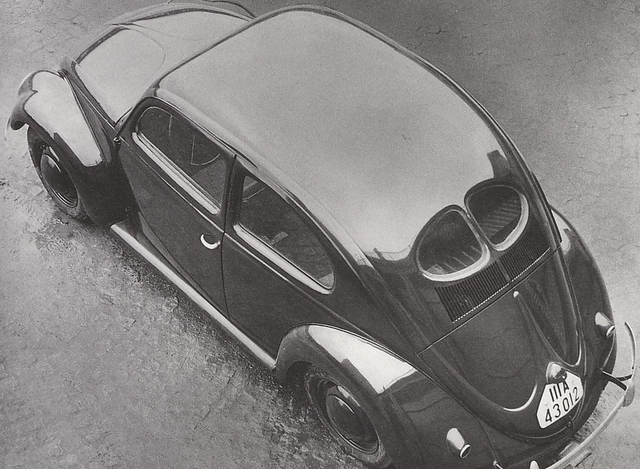 These can be seen in period photos of the VW38 series cars. Could anyone have fabricated this kind of stuff by accident? The owner also claims that there is evidence of 24 air slots per side under the rear window (later splits having 21 slots per side). The doors may be originals too. Car of this age should have house-door type of doorhandle without the finger recess as found on icepick handle doors. Hard to say from the pictures just how much has been hacked to install the non-vw doorhandles. I would like to see the inside pressing of thoses doors, because the doorhandles of the prototypes were at different positions than on later KdF cars. Dating of this car is only possible by looking at the surving unique features. Unfortunately all numbers are missing. The owner tells me there is a number found on the car, but he has a strong suspicion it is not original. There is a chance the car was originally without paperwork, so a number and identity of another car was assigned to it so it could be registered to be used on the road. Apparently it was registered as a DKW and has a VIN number much too long to be of a pre-war VW prototype. Another interesting feature is the color. It appears it may have been dark green originally. I’m not sure if that’s the green visible under the red though. So, what do you think? I’m far from being an expert on this kind of stuff. All I know is by looking at photos and what I can read in books, so please if anyone can correct me and/or add anything, you are welcome. I’m hoping to see this car in person, maybe in a few months. For now I can only go by what I see in the photos and what the owner has told me. 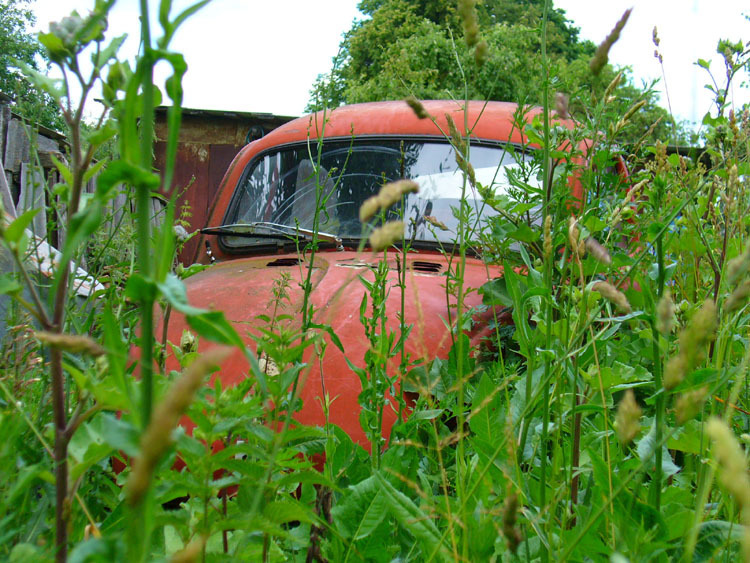 Indeed this could be one of the oldest VWs in existance (or what’s left of it). As soon as I get more information I’ll post it up. Pictures of the car as found. 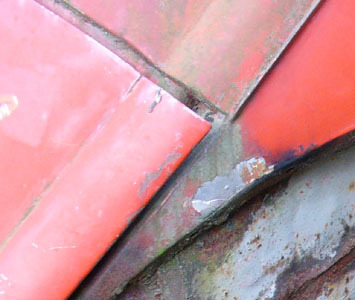 Picture of a pre-KdF decklid to illustrate the shape. 14	Next batch of new photos, more details are revealed. Lots of shots from the interior showing unique details present on vw38’s only. 22	List of chassis numbers/license plates, hard top/rag top specifications is posted. Additional information added to the list over the next few pages. 29	Postcard and other information about DAF in Königsberg/Kaliningrad. 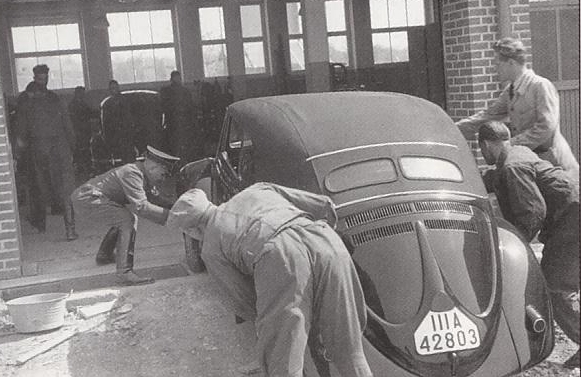 Possible historical connection to the car in Lithuania. 33	More information added to the list of chassis numbers/license plates. 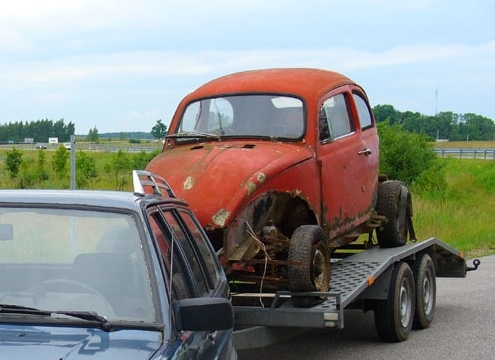 35	The VW38 arrives in Germany and news of a 1938 beetle chassis turning up! 63	Work on floor pan starts and a YouTube video from 2003 of the car is posted! Some of the photos have disappeared form this thread as they were not hosted on this site but they have been reposted on page 202 and 203. Unfortunately this is all the pictures I have. The owner has promised to send more, but he is a busy man, and I'm happy to have received his permission to pass this information on. I really want to see the interior too - or what's left of it. There's something strange going on with that car (look at the rake of the windscreen), but some of the parts look very VERY early to me! 5-knuckle door hinges and the engine lid does indeed appear to be early KdF. I agree. It looks an early KDF the few datails show that. More pictures could be useful. Could this be one of the original 38's at the cornerstone ceremony? The winsdscreen and the surrounding metalwork most probably comes from this car. A soviet built ZAZ. I just cannot understand why they went to all that trouble instead of just cutting a new piece of glass, if it was broken. I dont't think so, because according to literature, all three of those cars were destroyed. The hardtop and sunroof during road tests, and the covertible in the early fourties. This car must be one of subsequent prototypes built right after May 1938. The car on a trailer. That front end looks a mess! Buy it and put it back as close as possible. The car deserves it. The person who has it is a VW guy and knows old VWs. But I wouldn't want to be in his shoes, I mean it's hard enough and expensive to look for KdF stuff, but what do you do when you have about 20% off a hand built prototype? Amazing, What a find! Comparing your picture's that looks like a reasonable match to my novice eye. Staggering that in 09 such a rare part of a car could be found. 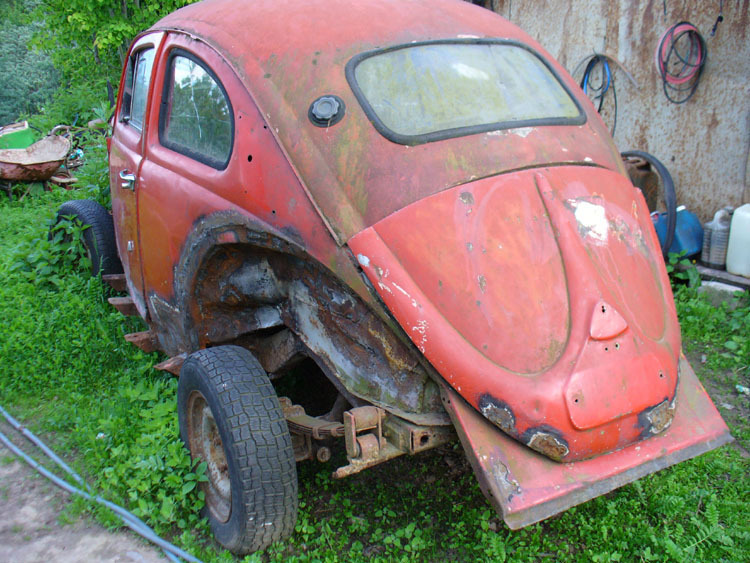 It would take more than alot of skill and money and stunningly rare parts to fix it but anything is possible.....Doesnt someone in Germany have a 38 pan or did i dream that? That could be copied for example ..
Keep us up todate, i really hope it does turn out to be what it looks like. obviously sitting on some other sort of frame. I would say that this is a vw38. None of those details like the braces or squared off corners of the decklid and hood or the shape of the license light were present on the production cars. Obviously been modified to death just to keep it running and pretty much impossible to get back to original but still quite a find. That car has had more surgery then Michael Jackson! It makes it difficult to figure out what is period and what is abortion. The doors are interesting. The outer scraper moulding only appears to go up the back and dosn't continue across the top of the window. There is no recess in the door behind the handle and the handle looks like it is something from mid 60's GM or Ford. So the recess was probably covered over when these handles were added. The most interesting parts are the door hinges and the rear deck lid. Its difficult to even guess what the rest of it is. The whole of the chassis has been changed to one from a front engined soviet Volga. 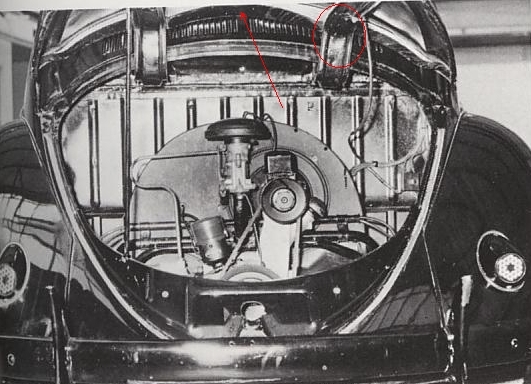 VW 38's had no recess for the door handle. They had a turn handle on the outside like a split decklid handle. The door was obviously modified to accept a stock beetle vent wing. Note the screw on the top of the door. Without seeing it in person and really being to crawl over it this is all conjecture but I would not be surprised if this were a vw38 or maybe a vw39. I tend to be the biggest skeptic on the planet, but this car does not strike me as a hoax. It looks to be an improbable survivor, from the first 50 preproduction batch of prototypes. I wonder if it has the defroster outlets in the corners of the windshield? This could be another identifier. 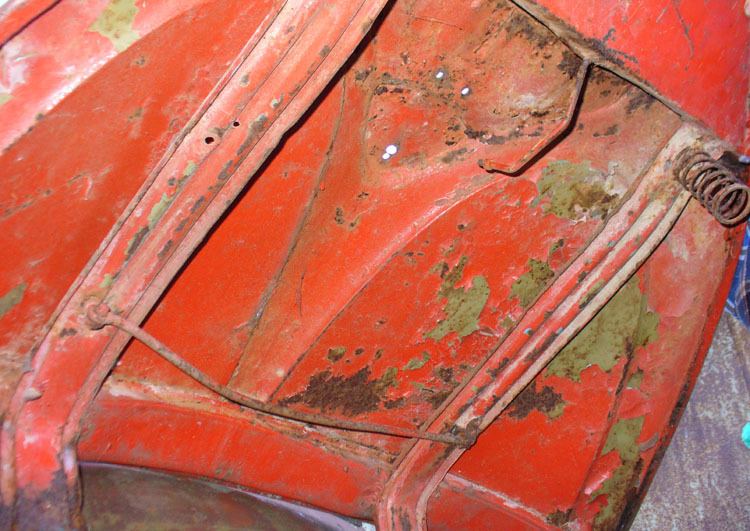 I think anything is restorable with the restoration talent that's out there today, but this shell would have to find its way to a very serious collector/restorer. The arguments for this shell being a VW38 (or VW39) are really compelling. We really need to see pictures of the insides of the doors. 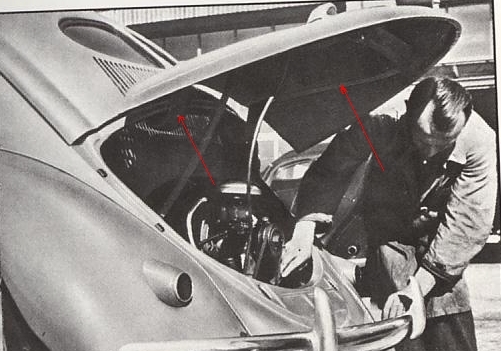 The door lock handle was near the middle of the door and level with the window winder handle on VW38s and VW39s. 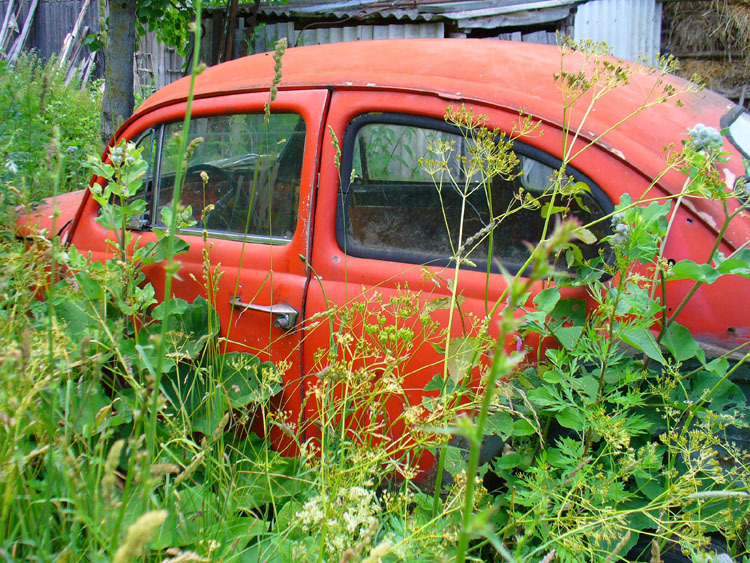 Whenever someone told me the story about a barnfind VW 38, I was laughing - but know I am speakless. Ok - we all never have seen such an ugly modified beetle - but a lot of tge surviving details makes sense. Lets all hope that the car once a time gets back in the delivered condition. on the front and rear hoods.